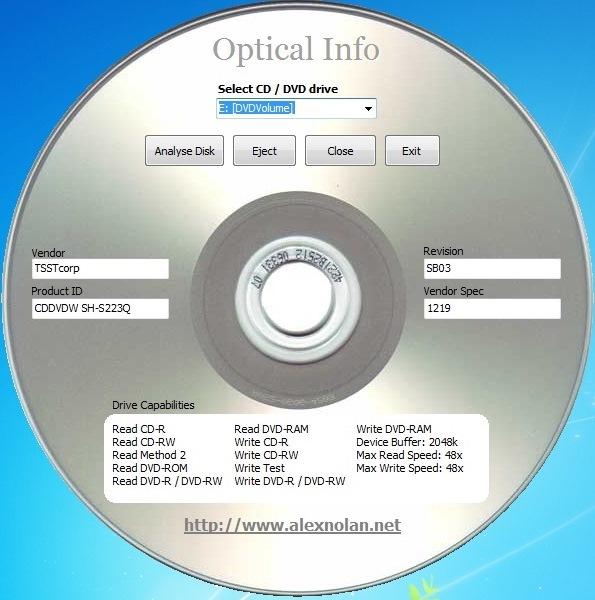 Optical Info detects and displays the read/write capabilities of any CD/DVD drive. This is useful because such drives don't often display their capabilities in the front panel, or the information may be blocked by the PC casing. 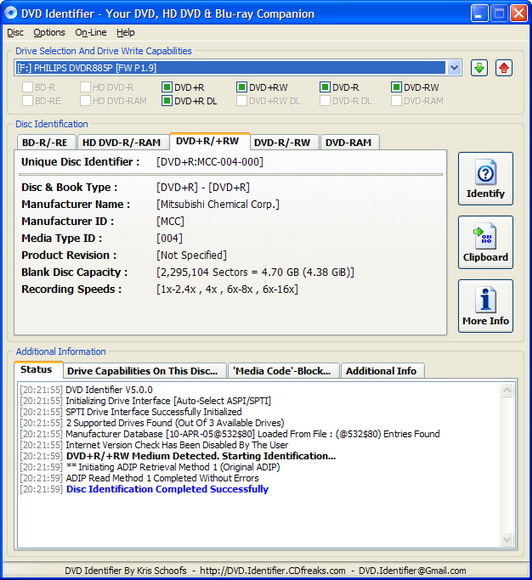 The utility allows you to select a CD/DVD drive by drive letter for analysis. How to extract: Download the ZIP package and extract to a folder of your choice. Launch optinfo.exe. I prefer "Nero Info Tool" instead because it displays more precise information about read/write modi of your cd/dvd burner, e.g. TAO/SAO/DAO etc. Along this you have some other useful information about drivers/ASPI/ide controllers etc. @ billon: Thanks ... and updated. DVD Identifier retrieves and interprets the pre-recorded information that is present on DVD and Blu-ray media. This information contains a variety of parameters such as disc manufacturing information and supported write speeds. Even though this information is usually printed on the packaging, the brand name may differ from the actual manufacturer or sometimes there might not even be any packaging information at all. There is a new version...someone know if it's portable or not? This not work out with UniExtractor and yes not portable ! !